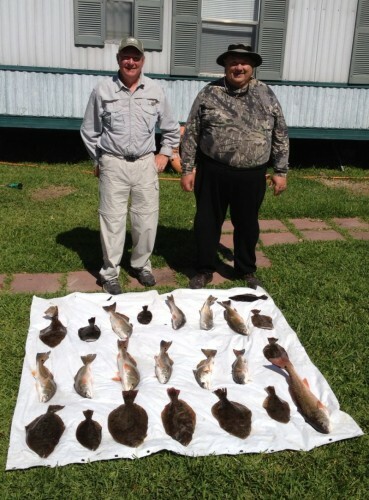 April 26, 2012 Rick P. & Mark Battle 25MPH Winds on Lake Calcasieu to put a Few Nice Ones in the Cooler!!! April 26, 2012 Rick P. & Mark Battle 25MPH Winds on Lake Calcasieu to put a Few Nice Ones in the Cooler!! We covered many miles and made many cast to overcome wind and muddy waters and bring home a few Big Lake Bronze Beauties!!! 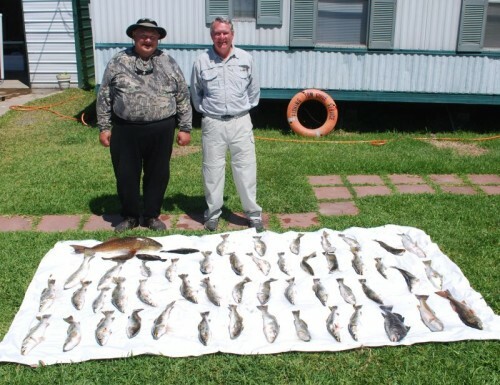 April 24, 2012 Robin P. & Gerald Day 2- Limit of 1 to 3 LB Lake Calcasieu Trout Before 8 AM!!! 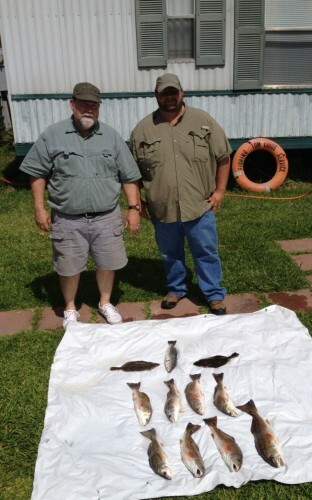 April 24, 2012 Robin P. & Gerald Day 2- Limit of 1 to 3 LB Lake Calcasieu Trout Before 8 AM!! Gulp and some great Net Work by Captain Tom filled the Cooler with a Limit of Nice Big Lake Silver Bullets before 8 AM!!! We then managed some Reds & Flounder to complete our Slams! It Doesn’t Get Any Better!!! 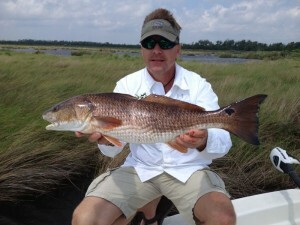 Plus this 29″ 9 lb Red! April 23, 2012 Robin P. & Brother in Law Gerald(Down from Canada) Catch some Nice Hackberry Halibut and Big Lake Bronze Beauties!!! April 23, 2012 Robin P. & Brother in Law Gerald (Down from Canada) Catch some Nice Hackberry Halibut and Big Lake Bronze Beauties!! Hi winds, Fresh & Muddy water could not stop Berkley Gulp and these Guys from catching some of Lake Calcasieu’s Best!!!! 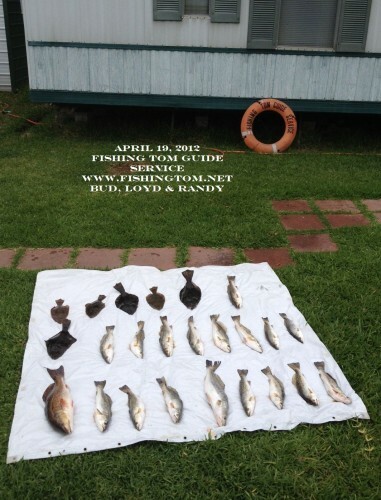 April 19, Bud, Loyd, & Randy Have a Good Time Exploring Lake Calcasieu and Catching a Mess!!! 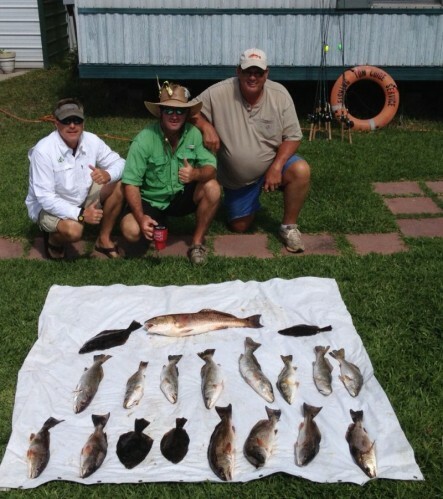 April 19, Bud, Loyd, & Randy Have a Good Time Exploring Lake Calcasieu and Catching a Mess!! A combo of Gulp and dead shrimp put some nice Big Lake Trout in the box. Loyd was the big fish winner with a 23 inch Big Lake Bronze Beauty. Then they finished the day with some Nice Hackberry Halibut!!! April 14, 2012 Bennie R And Friends John & Mark Fight 30 MPH Winds and Boat Some Nice Big Lake Slams!!! April 14, 2012 Bennie R And Friends John & Mark Fight 30 MPH Winds and Boat Some Nice Big Lake Slams!!! They did a great job on a tough day on Lake Calcasieu! Including this beautiful 26 inch 6 pound Redfish! April 13, 2012 Philip C. Catches a Nice Lake Calcasieu Limit of Bronze Beauties!!! 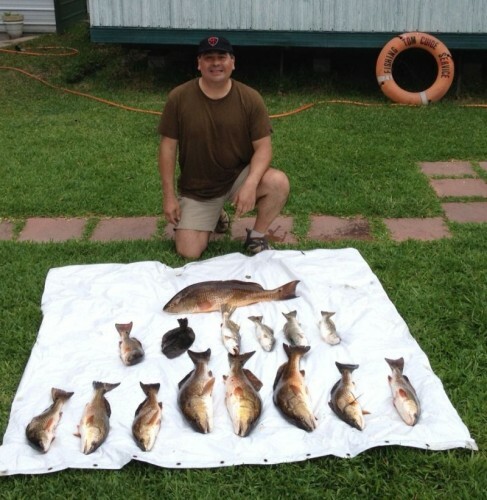 April 13, 2012 Philip C. Catches a Nice Lake Calcasieu Limit of Bronze Beauties!! Dead Bait and Gulp helped Philip catch some real nice Big Lake reds up to nine pounds with 4 trout and a flounder thrown in for his first Big Lake Slam!! !